For many travelers who have never spent time in Chicago, it is a surprisingly beautiful and culturally advanced city. Chicago day trips and day trips from Chicago to surrounding areas are a continual delight and offer plenty of outdoor and indoor activities for the entire family. Downtown Chicago is quite literally packed with great attractions. The advantage to the compact nature of these attractions is that you can spend a day in downtown and see many of the best landmarks that continue to make the city so popular. Begin your Chicago day trip of the downtown area as early as possible, as there is plenty to see. Your Chicago tour of the city center will be best enjoyed on foot, as cars tend to be more of a nuisance than a help. Begin at the Chicago ArchiCenter, which offers a two hour walking Chicago tour of the highest buildings. Continue your Chicago day trip with a tour of the Art Institute. Located in Grant Park, Buckingham Fountain and the park can combine to create a lovely day trip in Chicago. Pack a lunch or a snack, bring a blanket and a book or frisbee, and set off to enjoy a gorgeous fountain, a relaxing park, and of course plenty of people-watching. Head to Millennium Park and the Michigan Avenue Bridge. Continue your Chicago tour with a stroll down the Magnificent Mile, a long stretch of shopping malls, boutiques and eateries. Finish the evening with a trip to the Oak Street Beach and the Gold Coast, where you can see some of the most elaborate and wealthy homes in Chicago. Famous throughout the world, Willis Tower (formerly the Sears Tower) is one of the most popular attractions in Chicago and a favorite among locals an visitors alike. This is the perfect place to get sweeping panoramic views of the Chicago skyline. The surrounding area is also quite entertaining and a great way to spend the day. The day tours Chicago offers can also be centered on museums. Chicago is famous for its highly cultured and progressive museums. The Field Museum of Natural History, the Adler Planetarium and Astronomy Museum, the Chicago Children's Museum, the Museum of Contemporary Art and the Smart Museum of Art are only a few of the excellent museums located in Chicago, many of which can be found nowhere else. One of the most popular day trips from Chicago is a trip to Oak Park. The day tours Chicago features to Oak Park are famous foremost because Oak Park is the birthplace of Ernest Hemingway and because is the site of the Frank Lloyd Wright Home. Frank Lloyd Wright had twenty-five buildings in the area, all of which feature a "Prairie School" style of architecture and are worth driving by for a tour. There is also an Ernest Hemingway Museum which is perhaps the most popular attraction in the town. Oak Park is about forty-five minutes by car from Chicago. 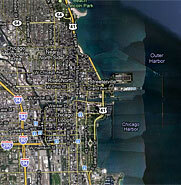 Another of the day tours Chicago offers from the city is a trip to Long Grove. The village of Long Grove is unique in that it maintains a rural feeling by requiring that all residences must be on an acre or more of land, so travelers will certainly never feel crowded in the area. The central business district is where travelers will find quaint shops with high end goods and crafts as well as great homemade cooking in local restaurants. There are also a number of yearly festivals designed to draw tourists, including the Chocolate Festival, Strawberry Festival, Apple Festival, Art Festival, and an Irish Days Festival.